Figures 1 and 2. 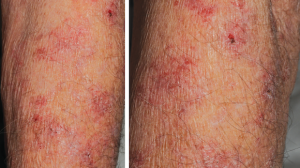 A different patient presented with new-onset pruritic, erythematous papules on the upper arms and upper back, similar to our patient’s lesions. 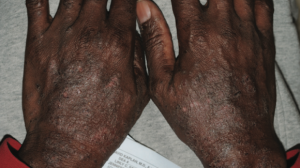 Case Report: A 73-year-old homeless man recently had received a diagnosis of cutaneous T-cell lymphoma with Sézary syndrome (T4N3B1M0). His chief concern was a pruritic dry rash of the bilateral upper extremities, which had spread progressively to his face, trunk, and legs. Peripheral blood flow cytometry results showed atypical T lymphocytes (43% predominance). Findings of a positron emission tomography plus computed tomography (PET/CT) scan showed hypermetabolic activity in the neck, bilateral subpectoral, axillary, and inguinal lymph nodes. Skin punch biopsy showed atypical lymphocytic infiltration. Biopsy of an epitrochlear lymph node demonstrated involvement with T-cell mycosis fungoides. He had been treated previously with bexarotene and photopheresis without significant improvement. He then had begun treatment with romidepsin. After the first 2 doses of the first cycle, the patient’s pruritus and rash resolved. He had no significant adverse reactions. 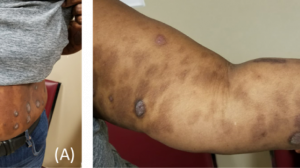 Case Report: During his visit for the second cycle of treatment with romidepsin, he presented with new-onset pruritic erythematous papules on the upper arm and upper back. (Figures 1 and 2 depict a different patient who had similar lesions.) Small red insects, soon to be identified as C lectularius, were found on the patient’s bed (Figure 3). The nurse caring for the patient believed that she had received bites, as well. The patient initially was in denial about having bed bugs and expressed anger and embarrassment when informed of the finding. The bed bugs had been brought to the hospital by the patient, and the truck cab in which he slept also was infested and was later fumigated. Through collaboration and consultation with social workers, nurses, hospital infection control specialists, and the state health department, a comprehensive protocol was developed that successfully prevented a bed bug infestation of the staff and facility. Measures taken at the clinic included having the patient shower and change into disposable scrubs, along with double-bagging of all his belongings. Staff involved directly in the care of the patient wore gowns and gloves. This allowed the patient to successfully complete 7 cycles of romidepsin in a busy outpatient infusion center. At the time of the patient’s last visit, he was found to be free of bed bugs. The treatment facility made the decision to dispose of some of the furniture used in the care of the patient (eg, the infusion chair). Diagnosis: The successful diagnosis of bed bug infestation must be confirmed by physical detection of the insects. Although the linear feeding pattern can be a reasonable indicator, this feeding pattern does not occur in all cases, such as when few bed bugs are present. The detection of bed bugs can be accomplished by way of visual inspection, isolation with physical traps baited with chemical attractants, or through the action of bed bug–detection dogs.27 Other signs can include molted cast skins of bed bugs, or feces or blood on bedding, mattresses, or wallpaper.28,29 Skin biopsies for detection of bed bug bites have proven to yield nonspecific results and are unnecessary. When diagnosing bed bug infestation, it is important to consider the differential diagnosis for other arthropod bites that result in pruritic papules. Bites of bat bugs or swallow bugs, scabies, fleas, Cheyletiella mites, and other mite species can be mistaken for bed bug bites. Dermatitis herpetiformis is also included in the differential diagnosis. 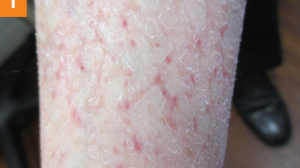 This rash is characterized by pruritic inflammatory papules and vesicles on the forearms, knees, scalp, or buttocks and can be confirmed via biopsy with direct immunofluorescence studies. 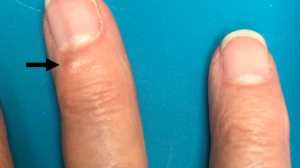 Treatment and Posttreatment Effects: Patients with bed bug bites should maintain good hygiene to prevent secondary infection and should avoid scratching the bites, although many patients will scratch them during sleep. Asymptomatic bed bug bites do not require treatment. Symptomatic management of patients with significant pruritus includes a topical corticosteroid, systemic antihistamine, or both.28,30,31 Secondary infections should be managed with appropriate antibiotics. Bed bug infestations can also produce serious physiological effects during and long after an episode has resolved. Bed bug bites and infestations can result in varying degrees of anxiety and depression, disruption in sleep, ostracism from friends and family, financial burdens, or loss of work. Furthermore, unaffected individuals may believe they have a bed bug infestation. 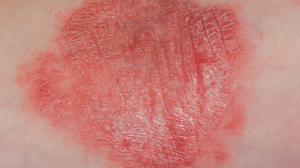 Mistaken individuals may report skin lesions resembling bed bug bites or exposure to an individual or family member with bed bugs. This may cause unaffected individuals to take measures to eradicate nonexistent bed bugs, resulting in personal or financial distress. Bed Bugs and Denial of Health Care: In 2013 in Hawaii, a 58-year-old terminally ill man with skin cancer metastatic to bone experienced the devastating effects of the denial of medical care due to fear of bed bug transmission.32 Bed bugs infested his home and bed, forcing him to sleep in a wheelchair in his living room. The patient subsequently was denied health care due to the risk of possible infestation of health care workers. This denial of health care not only caused the patient to break his clavicle trying to clean up the bed bugs, but also resulted in dehydration and hospitalization for 6 days as a result of acute kidney injury. In 2011, a 43-year-old woman who had been disabled for 10 years as a result of 3 motor vehicle accidents experienced a similar situation in Colorado.33 After speaking with her physician about a spinal injection for her back pain, the physician reportedly refused to provide her with health care due to a fear of bed bug spread and hospital infestation. Eventually, the physician performed the procedure after extensive preparation and education of the staff. These 2 examples demonstrate that bed bug infestation can seriously disrupt a patient’s access to health care and may result in delayed or deferred care. The first step is to identify patients with bed bug infestation at triage. If a patient presents with suspected bed bug infestation, a specimen can be sent to an entomologist for definitive identification.38 Contact precautions and changing the patient’s clothing into hospital scrubs is necessary. The patient’s belongings should be double-bagged and sealed with tape. These bagged items should be placed in extreme temperatures (above 60°C or below –17°C).2 Bed bugs are also capable of inhabiting and hiding inside electronic devices, and these items should also be taken into consideration. Patient education and counseling about eradication of bed bugs should be provided. These steps should be repeated with each patient visit until the patient and their residence is free of bed bugs. An alert should be added into the patient’s chart for present and future identification. The importance of education and awareness of hospital staff members is also fundamental to effectively managing these situations and avoiding the spread of infestation. The Take-Home Message: Bed bugs can negatively affect a patient’s ability to access timely and appropriate health care. Because of the costs associated with decontaminating a facility infested with bed bugs, careful screening at triage should be undertaken. At facilities that serve patient populations who are at risk for bed bug infestation, health care providers should be educated in bed bugs’ appearance and the lesions characteristic of their bites. Regarding patients presenting with bed bug infestation, a multidisciplinary approach involving social workers, nurses, hospital infection control personnel, housekeeping staff, and county or state public health authorities should be undertaken to protect other patients and frontline health care providers from bed bug infestation. Figure 3. 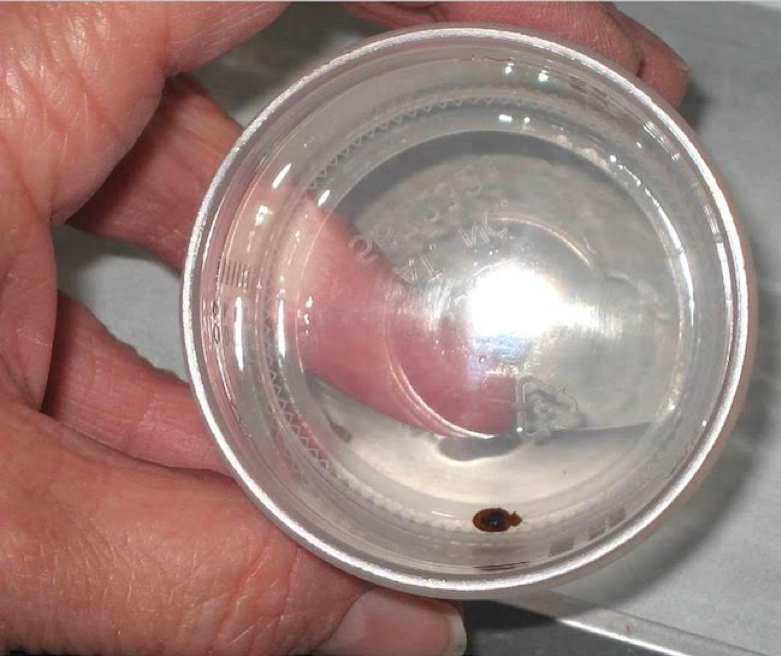 Clinical specimen of a bed bug (photo courtesy Ramon Sandin, MD). 3. Sabou M, Imperiale DG, Andrès E, et al. Bed bugs reproductive life cycle in the clothes of a patient suffering from Alzheimer’s disease results in iron deficiency anemia. Parasite. 2013;20:16. 4. Bandyopadhyay T, Kumar A, Saili A. 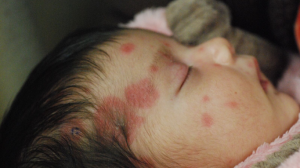 Bed bug outbreak in a neonatal unit. Epidemiol Infect. 2015;143(13):2865-2870. 5. Totten V, Charbonneau H, Hoch W, Shah S, Sheele JM. The cost of decontaminating an ED after finding a bed bug: results from a single academic medical center. Am J Emerg Med. 2016;34(3):649. 6. Feldlaufer MF, Loudon C. Undesirable dispersal of eggs and early-stage nymphs of the bed bug (Hemiptera: Cimicidae) by static electricity and air currents. J Entomol Sci. 2011;46(2):169-170. 7. Johnson CG. The ecology of the bed-bug, Cimex lectularius L., in Britain: report on research, 1935-40. J Hyg (Lond). 1941;41(4):345-461. 8. Doggett SL, Dwyer DE, Peñas PF, Russell RC. Bed bugs: clinical relevance and control options. Clin Microbiol Rev. 2012;25(1):164-192. 10. Abdel-Naser MB, Lotfy RA, Al-Sherbiny MM, Sayed Ali NM. Patients with papular urticaria have IgG antibodies to bedbug (Cimex lectularius) antigens. Parasitol Res. 2006;98(6):550-556. 11. Quach KA, Zaenglein AL. The eyelid sign: a clue to bed bug bites. Pediatr Dermatol. 2014;31(3):353-355. 12. Patterson JW. Arthropod-induced diseases. In: Patterson JW. Weedon’s Skin Pathology. 4th ed. Philadelphia, PA: Churchill Livingstone Elsevier; 2016:chap 30. 13. Liebold K, Schliemann-Willers S, Wollina U. Disseminated bullous eruption with systemic reaction caused by Cimex lectularius. J Eur Acad Dermatol Venereol. 2003;17(4):461-463. 14. Fletcher CL, Ardern-Jones MR, Hay RJ. Widespread bullous eruption due to multiple bed bug bites. Clin Exp Dermatol. 2002;27(1):74-75. 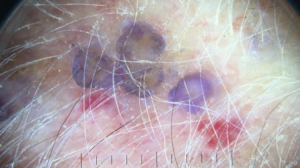 15.	deShazo RD, Feldlaufer MF, Mihm MC Jr, Goddard J. Bullous reactions to bedbug bites reflect cutaneous vasculitis. Am J Med. 2012;125(7):688-694. 16. Tharakaram S. Bullous eruption due to Cimex lecticularis. Clin Exp Dermatol. 1999;24(3):241-242. 17. Phan C, Brunet-Possenti F, Marinho E, Petit A. Systemic reactions caused by bed bug bites. Clin Infect Dis. 2016;63(2):284-285. 18. Lai O, Ho D, Glick S, Jagdeo J. Bed bugs and possible transmission of human pathogens: a systematic review. Arch Dermatol Res. 2016;308(8):531-538. 19. Vall Mayans M, Hall AJ, Inskip HM, et al. Do bedbugs transmit hepatitis B? Lancet. 1994;343(8900):761-763. 20. Silverman AL, Qu LH, Blow J, Zitron IM, Gordon SC, Walker ED. Assessment of hepatitis B virus DNA and hepatitis C virus RNA in the common bedbug (Cimex lectularius L.) and kissing bug (Rodnius prolixus). Am J Gastroenterol. 2001;96(7):2194-2198. 21. Salazar R, Castillo-Neyra R, Tustin AW, Borrini-Mayorí K, Náquira C, Levy MZ. Bed bugs (Cimex lectularius) as vectors of Trypanosoma cruzi. Am J Trop Med Hyg. 2015;92(2):331-335. 22. Webb PA, Happ CM, Maupin GO, Johnson BJ, Ou CY, Monath TP. Potential for insect transmission of HIV: experimental exposure of Cimex hemipterus and Toxorhynchites amboinensis to human immunodeficiency virus. J Infect Dis. 1989;160(6):970-977. 23. Jupp PG, Lyons SF. Experimental assessment of bedbugs (Cimex lectularius and Cimex hemipterus) and mosquitoes (Aedes aegypti formosus) as vectors of human immunodeficiency virus. AIDS. 1987;1(3):171-174. 24. Lowe CF, Romney MG. Bedbugs as vectors for drug-resistant bacteria. Emerg Infect Dis. 2011;17(6):1132-1134. 25. Barbarin AM, Hu B, Nachamkin I, Levy MZ. Colonization of Cimex lectularius with methicillin-resistant Staphylococcus aureus. Environ Microbiol. 2014;16(5):1222-1224. 26. Goddard J. Bed bugs (Cimex lectularius) and clinical consequences of their bites. JAMA. 2009;301(13):1358-1366. 27. Vaidyanathan R, Feldlaufer MF. Bed bug detection: current technologies and future directions. Am J Trop Med Hyg. 2013;88(4):619-625. 28. Thomas I, Kihiczak GG, Schwartz RA. Bedbug bites: a review. Int J Dermatol. 2004;43(6):430-433. 29. Cleary CJ, Buchanan D. Diagnosis and management of bedbugs: an emerging U.S. Infestation. Nurse Pract. 2004;29(6):46-48. 30. McNeill C, Jarrett A, Shreve MD. Bed bugs: current treatment guidelines. J Nurse Pract. 2017;13(6):381-388. 31. Minocha R, Wang C, Dang K, Webb CE, Fernández-Peñas P, Doggett SL. 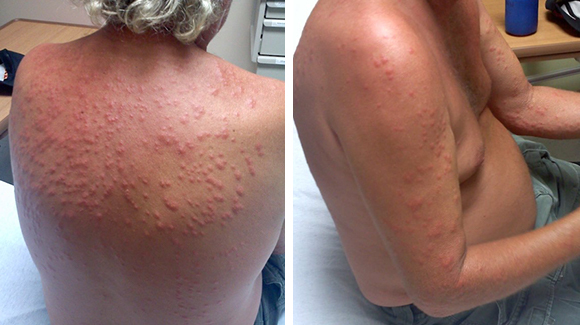 Systemic and erythrodermic reactions following repeated exposure to bites from the common bed bug Cimex lectularius (Hemiptera: Cimicidae). Austral Entomol. 2016;16:417. 32. Lincoln M. Terminally ill patient denied treatment due to bed bug infestation. Hawaii News Now. http://www.hawaiinewsnow.com/story/23700606/terminally-ill-patient-says-he-is-denied-treatment-due-to-bed-bug-infestation. Published 2013. Accessed July 11, 2018. 33. James SD. Woman with bedbugs denied doc’s treatment. ABC News. 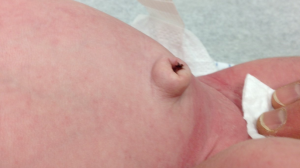 http://abcnews.go.com/Health/colorado-woman-refused-medical-procedure-bed-bug-bites/story?id=13725067. Published May 31, 2011. Accessed July 11, 2018. 34. Sheele JM, Barrett E, Farhan O, Morris N. Analysis of bed bug (Cimex lectularius) introductions into an academic medical center. Infect Control Hosp Epidemiol. 2017;38(5):623-624. 35. Jourdain F, Delaunay P, Bérenger J-M, Perrin Y, Robert V. The common bed bug (Cimex lectularius) in metropolitan France: survey on the attitudes and practices of private- and public-sector professionals. Parasite. 2016;23:38. 36. Barnes ER, Murray BS. Bedbugs: what nurses need to know. Am J Nurs. 2013;113(10):58-62. 37. Sfeir M, Munoz-Price LS. Scabies and bedbugs in hospital outbreaks. Curr Infect Dis Rep. 2014;16(8):412. 38. Usinger RL. Monograph of Cimicidae (Hemiptera-Heteroptera). College Park, MD: Entomological Society of America; 1966. http://www.drjackdisinfestazioni.it/doc/Monograph%20of%20Cimicidae.pdf. Accessed July 11, 2018. 39. Telford SR III. Arthropods of medical importance. In: Jorgensen JH, Pfaller MA, Carroll KC, et al, eds. Manual of Clinical Microbiology. Vol 2. 11th ed. Washington, DC: ASM Press; 2018:chap 148.